The Transatlantic Trade and Investment Partnership (TTIP) is a trade agreement that is currently being negotiated between the United States and the European Union. TTIP has already raised many concerns among civil society, trade unions, consumer groups, some businesses, and European and national institutions. From a digital rights perspective, EDRi and its members have identified several threats to transparency, democracy, the rule of law, the fundamental rights to privacy and data protection, net neutrality and to human rights in general. 1. Insufficient transparency and democratic deficit: not a good starting point. 2. Regulatory Cooperation: adding bureaucratic hurdles as a way of removing bureaucratic hurdles. 3. TTIP & Data Protection: secrets and lies. 4. Surveillance and encryption: no to entangled alliances. 5. 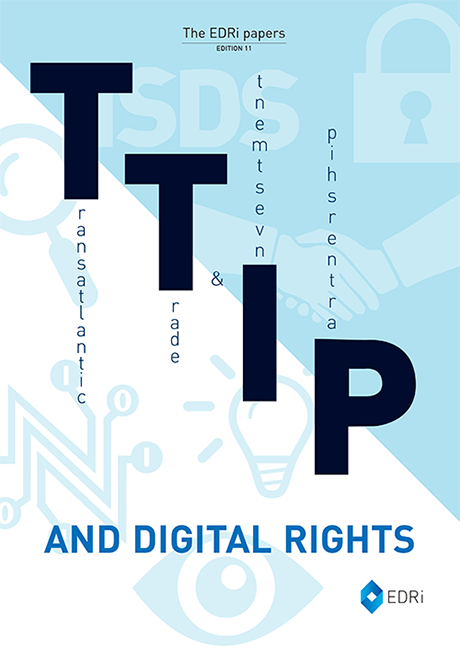 Copyright and other IP rights in TTIP: Interference with the EU’s democratic process. 6. TTIP & Net neutrality: is this the end of Internet as we know it? 7. ISDS: Incompatible with democratic rule of law. 8. A Human Rights clause must be meaningful.